"This is an old-fashioned recipe passed down from my grandmother. When she told me the recipe, my mouth dropped. You mean you actually put a potato in this candy? Yes, you actually use a potato. The candy is very rich but it tastes so good." Place potato into a saucepan with enough water to cover and bring to a boil. Reduce heat to medium-low and cook potato until very tender, about 15 minutes. Drain and allow to steam dry for a minute or two. Transfer potato to a large bowl and mash with a fork until smooth. Gradually stir confectioners' sugar into mashed potato a little at a time until the mixture forms a stiff dough. The dough will be runny until all the powdered sugar is used. Place a large square of waxed paper onto a work surface. Roll or press dough into a 12-inch square rectangle on the waxed paper. Spread peanut butter over top of dough, covering it entirely. Pick up one edge of waxed paper and start rolling the dough to make a 12-inch-long log. Wrap log tightly with waxed paper. Refrigerate for 1 hour. Unwrap log and slice candy into cross-sectional pieces about 3/4-inch thick to serve. This was way to SWEET!!!! Only had a Few Bites & Tossed it. I have been making this for 70 years but never knew it was called Irish since I am German! 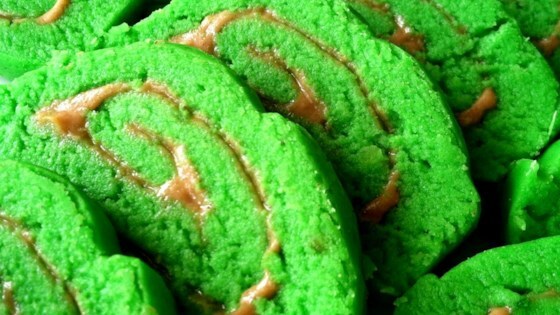 We all love it and even use food coloring at Christmas time to give it either red or green!